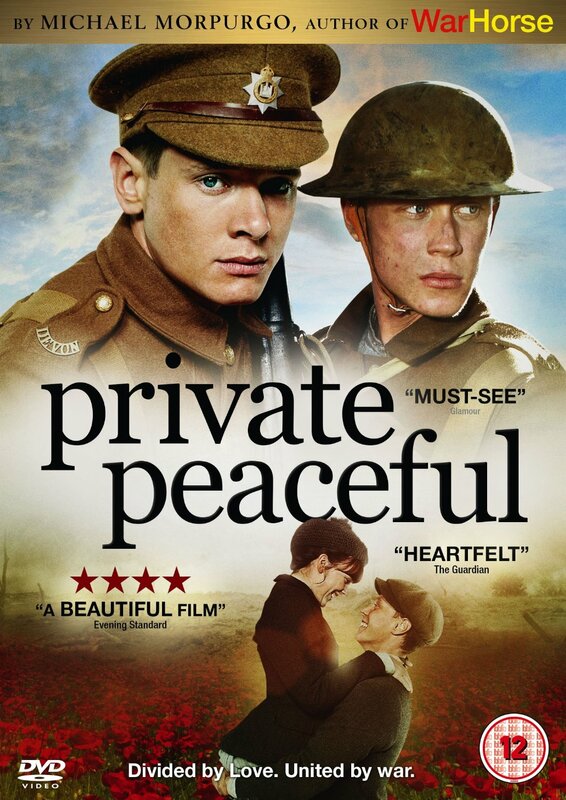 I finally got round to watching Private Peaceful at the weekend; although I have had it for a while I had not got round to watching it, possibly subconsciously dreading what it would be like. First, a confession. I haven’t read any of Michael Morpurgo’s books, so I can’t compare how faithful it is to the original story. I saw the stage show of War Horse and was very impressed, more at the design and operation of the ‘puppets’ than the actual story itself. And the film version…well, it copied the stage version pretty closely, let’s just leave it at that. So I came to watch Private Peaceful armed only with my preconceptions from Warhorse and the various opinions of Morpurgo and his work that have popped up on my Twitter feed over the last couple of years. I won’t dwell too much on the story in case readers want to see the film, but it centres on the two Peaceful brothers, who swap their poverty-stricken but still somewhat idyllic life in Devon for the battlefields when they enlist on the outbreak of war. Needless to say the war does not end well for one of them, who ends up facing a Field General Court Martial for cowardice. Needless to say the film did not disappoint in fulfilling many of my preconceptions. Morpurgo seems to have a saccharine view of pre-war working class Britain (the agricultural side at least), of hard working families who suffer a run of bad luck, but it’s ok because they love each other and that gets them through it. There is an undercurrent of simmering class tensions that isn’t really explored in great detail, espoused by the local landowner, a pompous ex-soldier (officer of course) who peers down his nose at the local workers in a kind of benevolent sneer. This stereotype in Private Peaceful is played for all it’s worth by Richard Griffiths, the only performance in the film that really grated and I took an intense dislike to. Without a shadow of a doubt the most disappointing scene is when the execution papers are taken to Haig for approval. He is seen in a large chateau, playing billiards on his own, seemingly with nothing better to do. Passed the papers, he gives them a cursory glance before scrawling his signature and returning to his game. This is a gross misrepresentation of Haig and won’t do any favours in dispelling the myth of ‘lions led by donkeys’. Without the large budget of Warhorse, Private Peaceful still does well at recreating the wartime battlefields, largely thanks to the excellent work of Taff Gillingham of Khaki Devil. The trenches and battle scenes convey something of what it must have been like, and the uniforms and equipment seem up to scratch, at least to my untrained eye; for example as the film progresses from 1915 to 1916, the soldiers’ cloth caps are replaced by Brodie helmets. Private Peaceful lacks something of the immediacy of impact of the War Horse story, and seems to have had rather a low key release. Given the morality of the issues the film deals with, the rights and wrongs of the trial and it’s outcome are not explored; this feels like a missed opportunity and leaves the judgement of the viewer based on the somewhat biased portrayal of the film. It’s probably not a film I would rush to watch again any time soon, but saying that it fares ok compared to some of the distinctly poor First World war films I have seen. i recommend the book “Blindfold And Alone” for the background on the “Shot At Dawns” Quite a number were convicted murderers…..